At the end of every August, the Ga-Dangmes of Ghana celebrate an important festival: the Homowo festival. It is a fasting, harvesting, and New Year’s festival celebration. Sources say that the Gas traveled thousands of years through the East African Nubian Plains, Sudan, and Nigeria, some through parts of northern African to arrive at their present location in West Africa. The group, who now primarily live in Greater Accra, Eastern, and Volta regions of Ghana as well as certain areas in Togo and Benin, faced an extensive period of famine when they arrived at their present location. After many years, the people’s prayers were answered with record rainfall and abundant harvest. The Homowo Festival, which lasts a few months, is a celebration of the tribe’s survival, its feast mocking the famine period that nearly destroyed the group. The season also marks the beginning of a new year for the Ga people who use the “Nai-ye” rivers cycle chronology or the “Gbo”, the sacred ancient new-year month, which corresponds to an August-September new year on the Gregorian calendar. The season begins with a planting season called, Nmaa-dumo, or the planting of millet crop before May, the start of the raining season. Following the planting season, there is a total ban on noise throughout the Ga-state and finishing is limited to certain days in June. This ban is believed to give the gods rest to ensure a fruitful harvest. In early August, there is a special Yam festival to honor the Spirits, ‘the eternal protectors of the Ga people’. 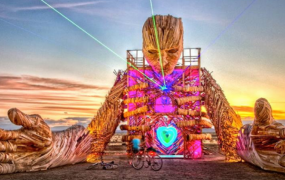 This marks the beginning of the celebration and harvest. 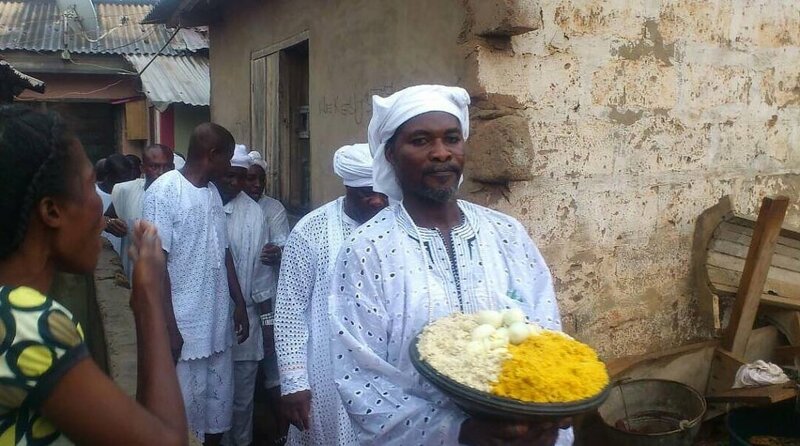 Homowo Day is usually a Saturday in August chosen by the Dantu priest of the tribe. 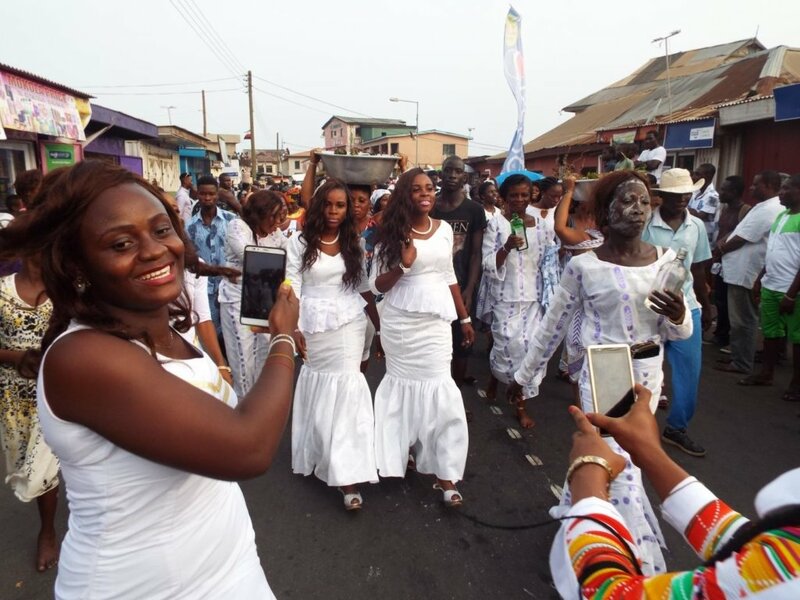 The Thursday before Homowo Day is Soobii or “Thursday People” day where thousands of people from all over the world travel to Accra plains to visit their families and their homeland. This group brings vegetables and other harvest products that are used to make the traditional Homowo meal shared by the living and dead. Crowds gather on the day to welcome these visitors home, beginning a period of peace and harmony where debts are forgiven and differences are put aside. The Friday preceding Homowo honors twins who are revered as special births in the Ga tribe. Twins are covered in whitish clay and dressed in all white clothing and taken before the priests for blessings. Gifts are also exchanged on this day. Friday night is Homowo Eve where people are warned to stay home as spirits are believed to wander the streets. Gunshots are often heard through the night as warning signals. 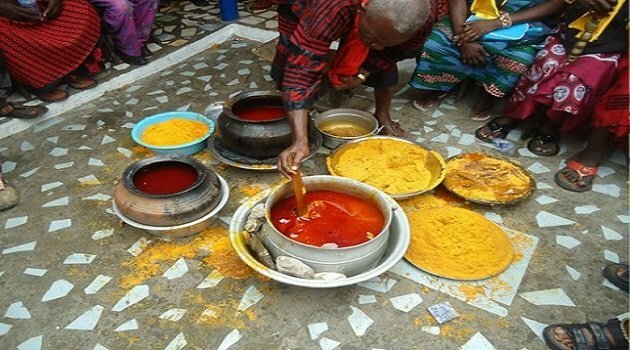 On Homowo Day, a traditional Ga dish called “kpokpoi” prepared for the ritual family feast. Each Ga chief, with a following of drummers, dancers, singers, and clan members tours his area and sprinkles some of the special dish and pours libations around doorsteps and other places where the spirits of the departed are likely to gather. 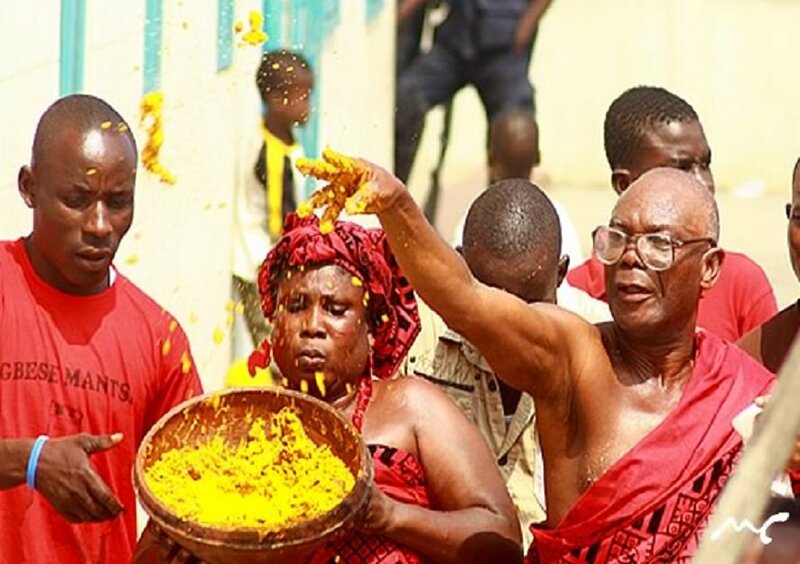 The paramount chief of the Ga, the Ga Mantse, also goes around sprinkling food for the gods for keeping the people safe and granting them another year. This is followed by a large family feast where people welcome visitors into their homes. The sharing of food is followed by a large durbar and the Homowo dance. On Sunday, also known as Noowala Day, people make family visits, exchanging new year’s greetings and well wishes. 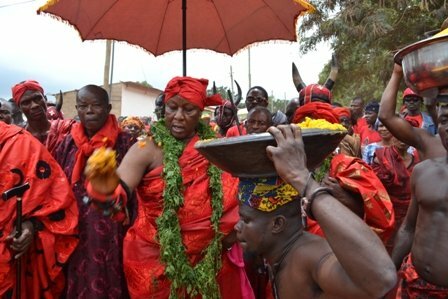 Homowo remains one of the most important festivals in Ghana and Africa as among its oldest ancestral celebration. It was long established before European colonization of sub-Saharan Africa and is celebrated till this day in Ghana and by Americans of African descent in cities like New York, Houston, Portland and Oregon. Watch a full documentary of past event below.